The Dream Catcher cabin is a great two-bedroom cabin. Location is secluded and private, but only a little over a mile walk to town. The cabin is pet-friendly and has a fenced yard. Dream Catcher has a wrap around deck with fabulous views and a nice BBQ. The outdoor Jacuzzi tub is located just off the master bedroom and is very private. 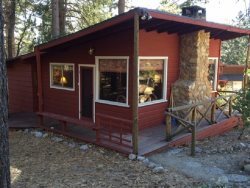 The cabin has both internet and cable for your convenience. The two bedroom/two bathroom cabin is ideal for two couples. The master bedroom has it's own private bathroom. There is a great wood burning stove for the winter that makes for a beautiful, romantic setting and an air conditioner for the warmer summer months. This cabin is Non-Smoking. Come experience a wonderful cabin with gorgeous forest views.